At ‘Girls’ Afternoon Tea’ we can be rather selfish about cake and a delicious cuppa. But every now and then it’s kind to share such luxury with the men in our lives – especially for occasions like Father’s Day or a special birthday treat. And so, here are some top tips for afternoon tea in London for gents. And where better to start than The Sanctum Soho… The setting: two beautiful Georgian townhouses converted into a boutique hotel, a stone’s throw from the shopping throng on Oxford Street. Here you can order a Gent’s Afternoon Tea with dishes to suit the manliest of men (oysters with Bloody Mary relish, seared steak, lamb hotpot). And the icing on the (non-existent) cake: a tankard of Jack Daniel’s and a cigar to smoke on the rooftop. 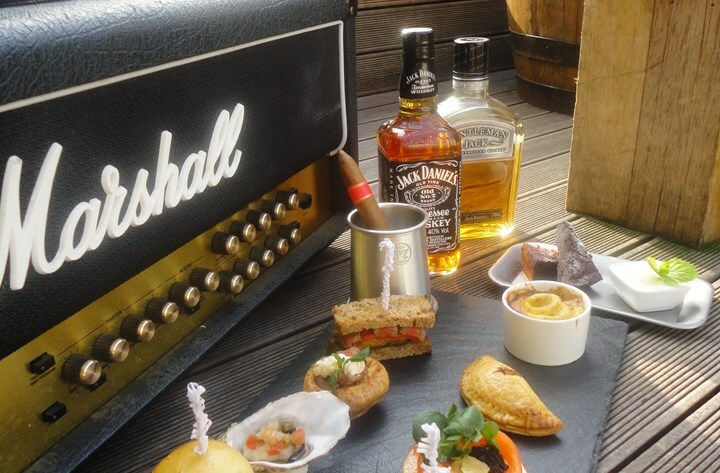 A Gents’ Tea at the Sanctum Soho: from £50pp. 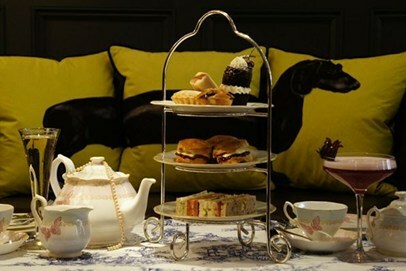 Book afternoon tea in London for the man in your life at The Sanctum, Soho . . .
Then there’s the Reform Social and Grill in the Mandeville Hotel in London’s Marylebone. It takes its design inspiration from classic British gentlemen’s clubs. You can order a Great British Gentlemen’s Afternoon Tea which, in the owner’s words, is ‘wholesome and masculine’. This boasts a very macho array of meaty dishes, such as British sausage roll and steak and snail sandwiches. The Mandeville Hotel, Mandeville Place, London W1U 2BE. Book afternoon tea online at the Reform Social and Grill . . .
Or maybe you want to get away from the mayhem of the centre of town. And there’s no need to deny your man a cucumber sandwich and glass of bubbly if that’s more to his liking. But why not do so surrounded by Blackheath’s Royal Golf Course? Eltham Lodge in Greenwich is a 17th century Grade 1 listed house, engulfed by acres of landscaped parkland and steeped in history. 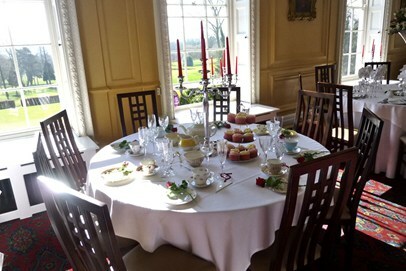 It offers afternoon tea with seasonal menus, and a glass of Laurent Perrier as an extra treat. Spoil your man and book afternoon tea at Eltham Lodge . . . If the man in your life is more of a history buff, why not take him to have afternoon tea Elizabethan-style, with a trip to The Swan next to Shakepeare’s Globe Theatre. With stunning views across the Thames and an assortment of savoury and sweet options, it’s the perfect place to combine sightseeing with a spot of sustenance. Afternoon tea here is relaxed, but traditional, and the menu includes a selection of loose teas (including popcorn and liquorice). Why not tread the boards and then book afternoon tea at The Swan, Shakespeare’s Globe . . .
From a journey into history, to a trip up high…if you’re after added adrenalin, the Aqua Shard may be your man’s cup of tea. With its 360* panoramic views of London, this contemporary restaurant on the 31st floor of The Shard is not for vertigo sufferers. With finger sandwiches, Victoria sponge and scones on this classic menu, the setting couldn’t be more modern if it tried. The sky’s no limit. Book afternoon tea at Aqua Shard . . . These are our suggestions for the best gents afternoon tea in London. Please feel free to tell us your favourite venues for afternoon tea in London. Simply drop us a quick note using the form below. Gents Afternoon Tea in London: Go on, give him an afternoon out with a difference. If you would like further inspiration, take a moment to browse our other venues for afternoon tea in London. A huge thanks to Tessa Parry-Wingfield for this delicous blog. If you’re looking for gift ideas for the men in your life, be sure to check out Gifts for Men for fun, quirky and sometimes practical gift ideas for men. Great gift inspiration for the love of your life, Dad, top tech brother and geeky nephew.